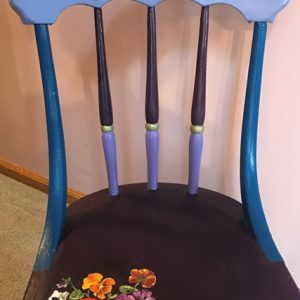 Chair base painted with no pansies yet painted. 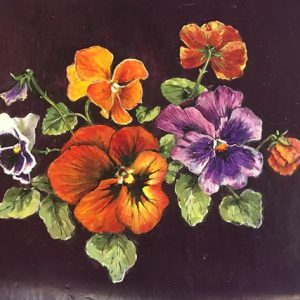 Pansies are so wonderfully varied and intense! 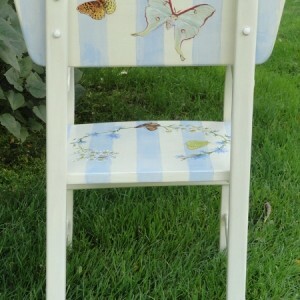 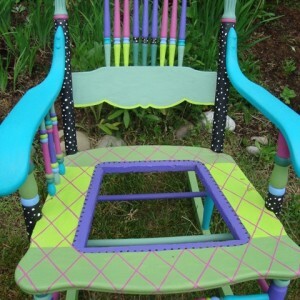 I had to restrain my self from choosing too many when painting this sturdy vintage chair. 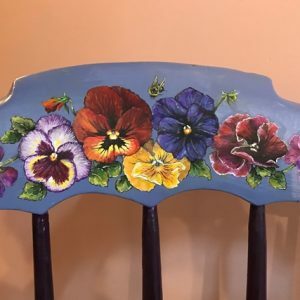 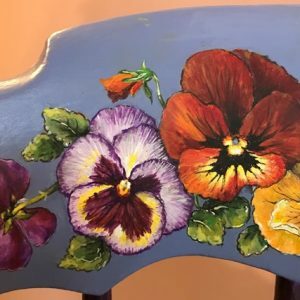 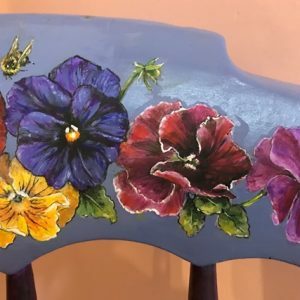 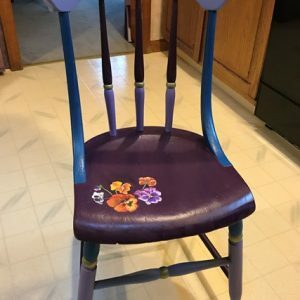 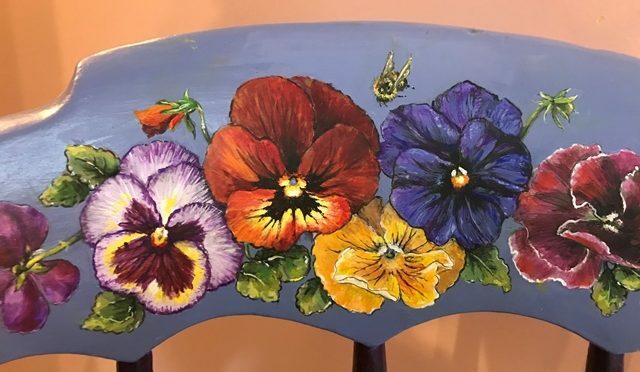 I painted over the original black paint in purples and blues before embellishing the seat and the back rest with blossoms featuring orange and yellow. 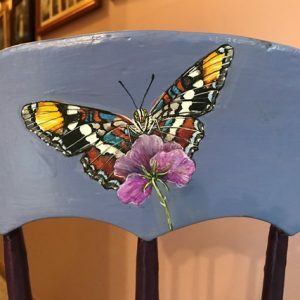 My signature insects are on the backrest; a bee on the front and a distinctive butterfly on the reverse. 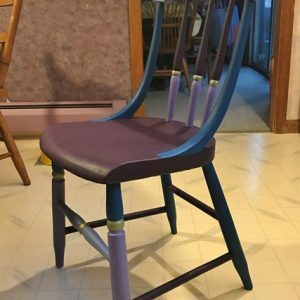 This chair is available for sale for $325 plus shipping and handling. 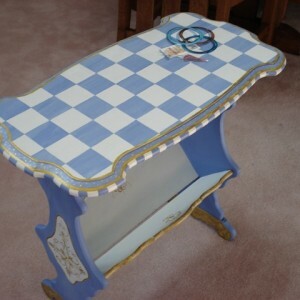 Contact me through this site if you are interested in purchasing it. 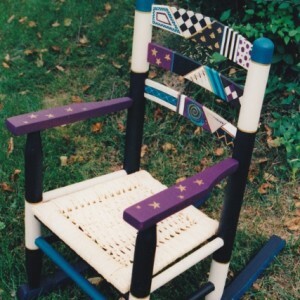 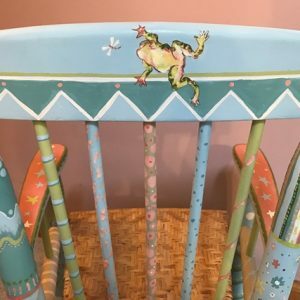 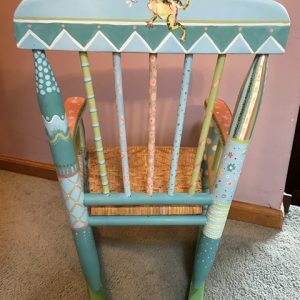 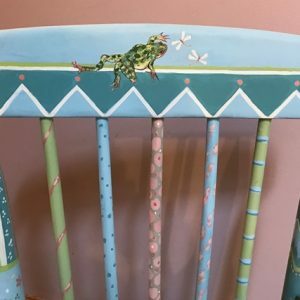 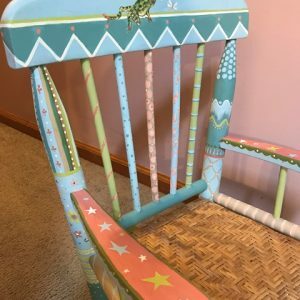 This child’s rocker is painted with lots of happy doodles of stars, stripes, dots, hearts and a few little flowers in shades of blues, greens, salmon and white. 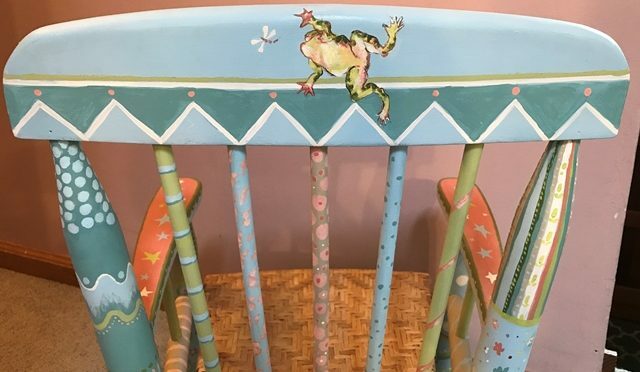 I painted energetic frogs leaping at dragon flies on both the front and rear backrests. 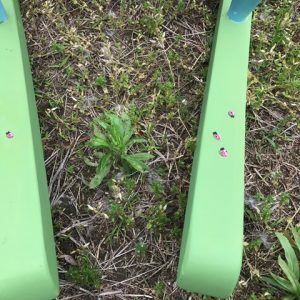 Lady bugs creep along the runners. 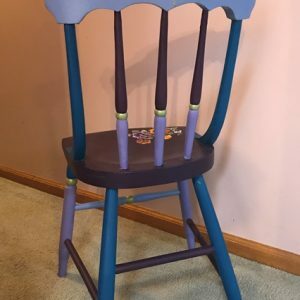 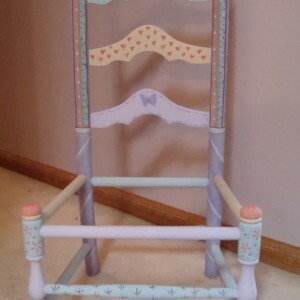 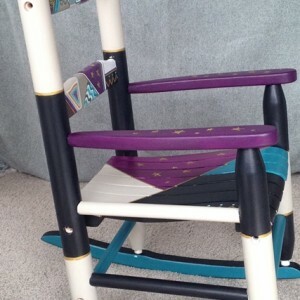 This very sturdy rocking chair stands 25″ tall and is 15″ across the backrest. 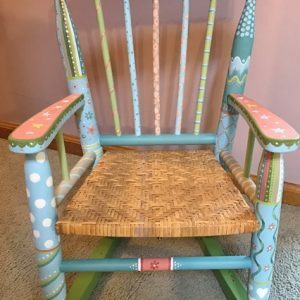 The seat is wicker. 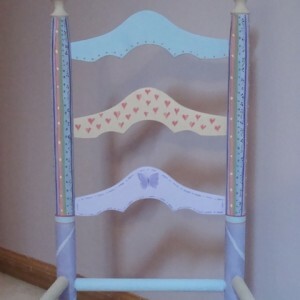 It is appropriate for a girl or boy. 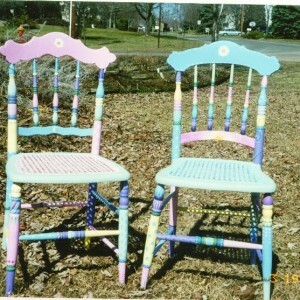 For Sale at $125 plus shipping and handling. 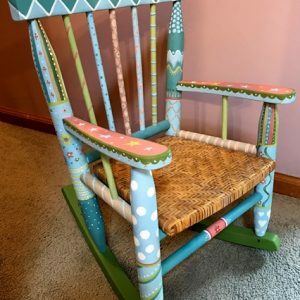 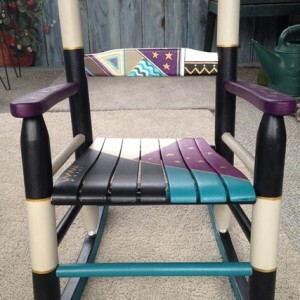 This child’s rocker is based on a chair I did a number of years ago. 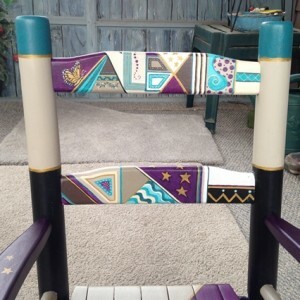 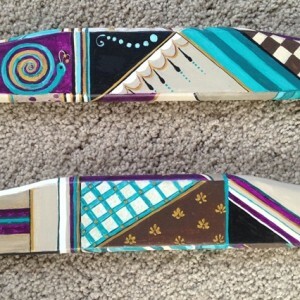 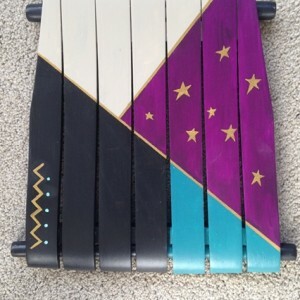 I painted both in abstract geometric designs with bold colors; purple, teal, cream, black and gold. 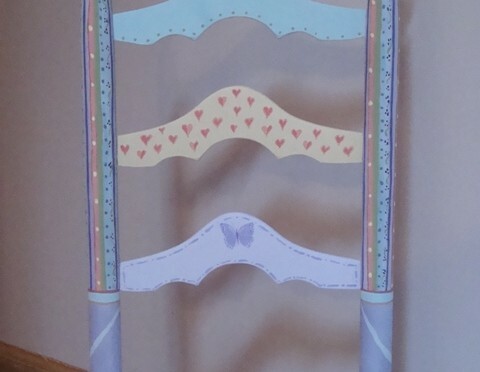 I even managed to include a snail and a butterfly. 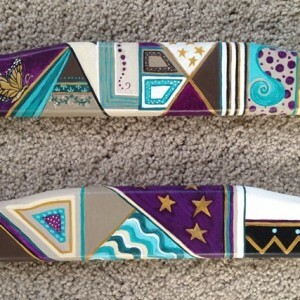 The style works well for either a boy or a girl. 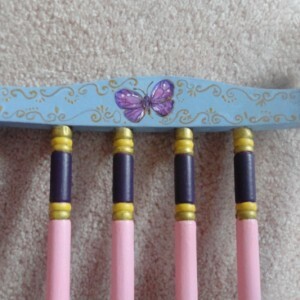 In this instance I customized the design for a particular little girl. 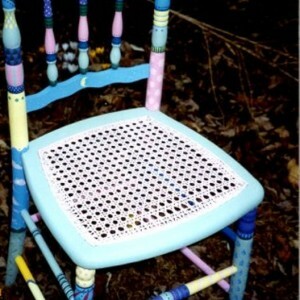 Can you discern her name??? 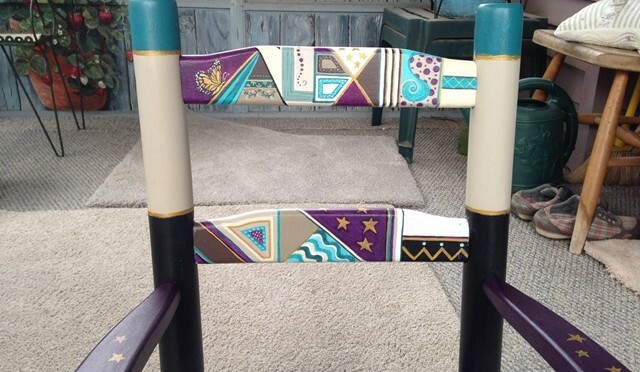 Here are some ideas for abstract designs on furniture; Always a fun project! 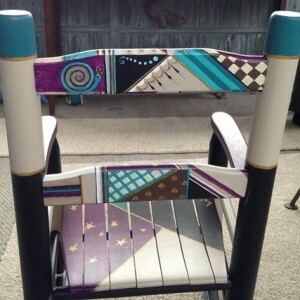 Do you have a piece that cries out for embellishment? 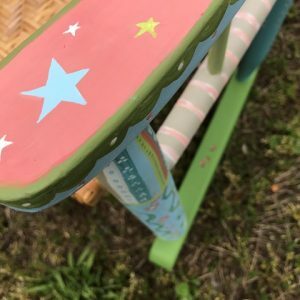 Please feel free to contact me .